HIJACK > Food for your Ears > Hijackers' Tunes and Mixes > M-Set ft. Agman Gora - Fight For Your Lives / Iqama - Out Now on AutomAte! 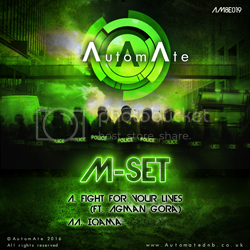 M-Set ft. Agman Gora - Fight For Your Lives / Iqama - Out Now on AutomAte! M-Set & Agman Gora are a formidable merging of talent. With M-Set bringing the foreboding, darkly lit atmospherics and Agman riding the bassline with horrorshow vocals, it's a match that will discharge crowds worldwide. Released on AutomAte, never shying away from the more down & dirty records, they're here for a knockout with old-school stylistic features whilst incorporating contemporary production standards. M-Set deliver once again and, with Gora's help, bring their music into an even murkier dimension. Agman Gora has fully laid out his musicianship across the first few bars and throughout Fight for Your Lives he presents a cult-like persona. Aptly named, the track leaves you gasping for breath, a techy, nastily conceived roller that nips with every break. The MC is described as a ‘leader, a convicted murderer, the only living musician known to be medically dead'. A hyperbole? Not if you hear the rasping, moody vocals he carries on a track With 90s synth and clanking drums, M-Set help to set the pace, keeping the 170bpm whilst dragging you through creepy soundscapes. A record for the shadowy months, prepare to be fully enveloped in a world underpinned by fear. Iqama is brooding, with middle-eastern flares and crunchy snare. Winding up slowly, it focuses on the journey, slowly drawing you in inch by inch. With each loop, you're drawn ever deeper, until it catapults you into a crashing whirlpool of snapping beats and driving bassline. M-set are masters of their craft, slicing up layers of sound and hitting you harder with every segment. Constantly changing direction, it doesn't give you time to breathe. It's as relentless as it is heavy-hitting, with a complex design which would be intimidating to even the most experienced producer. M-Set definitely prove their weight, teaching you why they're going to become artists that resound across the genre for years to come. There's no turning back this time.